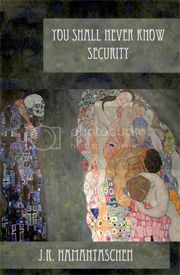 The thirteen tales collected in You Shall Never Know Security, by J.R. Hamantaschen, are strange. Dark and strange. I’d even go so far as to use the term “bizarro” for some of them. Not all, but a few. At the ripe old age of twenty-seven, Hamantaschen has a deft hand when it comes to language, but sometimes the wordage grows unwieldy. Sometimes less is more, as they say. One of the few complaints I have with this collection is that some of his word usage made me feel stupid and wishing I had a dictionary close by. But onto more important things, the stories. We begin with a high school drama, a la Lovecraft, titled “A Lower Power.” This one is full of adolescent snark and otherworldly snarl. “Wonder” is one of my favorites from the collection and there is not much I can tell without spoiling the magic. “Endemic” is a high tech off-kilter tale of Internet popularity. The literal title of “A Parasite Inside Your Brain” tells you all you need to know about this one. There is a great deal of black humor to these, none more evident than in “Jordan, When Are You Going to Settle Down, Get Married and Have Us Some Children?” where a very nervous man, saddled with a unique curse, rediscovers why he has remained alone. “College” is an exercise in humanity courses, taken to the Nth degree. “Nothing” is another fist to the forehead. 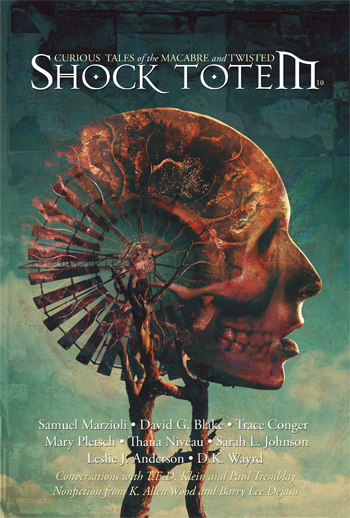 And the volume closes with the darkly brilliant “There Must Be Lights Burning Brighter, Somewhere.” This novella-length tale is compelling and unique. Well worth the price of admission alone. If you like your fiction unique and on the darker side, if you wonder what Robert Aickman would sound like had he written in the Now instead of the Then…your answer is here. 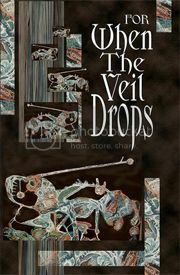 For When the Veil Drops is the second release from West Pigeon Press, the first being the Hamantaschen collection above. While the previous is a single-author collection, For When the Veil Drops is an anthology featuring work by fifteen authors, Hamantaschen included. It contains some brilliant work, as well as a few that left me shaking my head. Christian A. Larsen’s “724” gives us a scenario we’ve read before but delivered in a very strong way. “The Chopping Block,” by Doug Murano, is a slightly surreal and brutally effective survival drill. Yarrow Paisley gives us a Lovecraftian plague in “The Persistence of Frondu.” One of the strongest pieces comes from Michael Wehunt, whose “A Coat That Fell” is haunting in its bleakness and raw power. The stories that I didn’t mention were not exactly bad, they just failed to resonate with me for some reason…but trust me, the ones that did make it well worth your time and money. For a new press, and a table of contents full of mostly newer names, this is a strong anthology. I have feeling we’ll be seeing quite a few of these authors for some time to come. This entry was posted in Blog, Book Reviews, Reviews and tagged A.A. Garrison, Anthology, BV Lawson, C. Bryan Brown, Christian A. Larsen, Doug Murano, J.R. Hamantaschen, Joshua Clark Orkin, Lydia Peever, Michael Trudeau, Michael Wehunt, Nick Medina, Paul S. Bates, Robert Aickman, Robin Wyatt Dunn, Samuel Minier, Short Story Collection, West Pigeon Press, Yarrow Paisley. Bookmark the permalink.